Seth Lugo put up seven strong innings and Yoenis Cespedes drove in five runs following an emotional pre-game ceremony in Atlanta. In the last game the team will ever play at Turner Field, the offense put up a lead so insurmountable that the Mets’ own bullpen could not overcome it with their command struggles. The 10-3 victory, combined with a narrow Cardinals’ loss, gave the team a half-game lead for the second NL Wild Card spot. Braves’ starter Williams Perez had rough time during his short start. He relied heavily on hitting the corners with his low 90s sinker, but often got too much of the plate and Mets’ hitters took advantage. After Asdrubal Cabrera hit a first inning triple on just such a pitch, Yoenis Cespedes hit a hard groundball to plate the game’s first run. Perez was more effective during the second inning, effectively working down in the zone. Things fell apart for the righty in the third, as Lugo drew a walk and three straight batters hit low, glove side sinkers for hits. 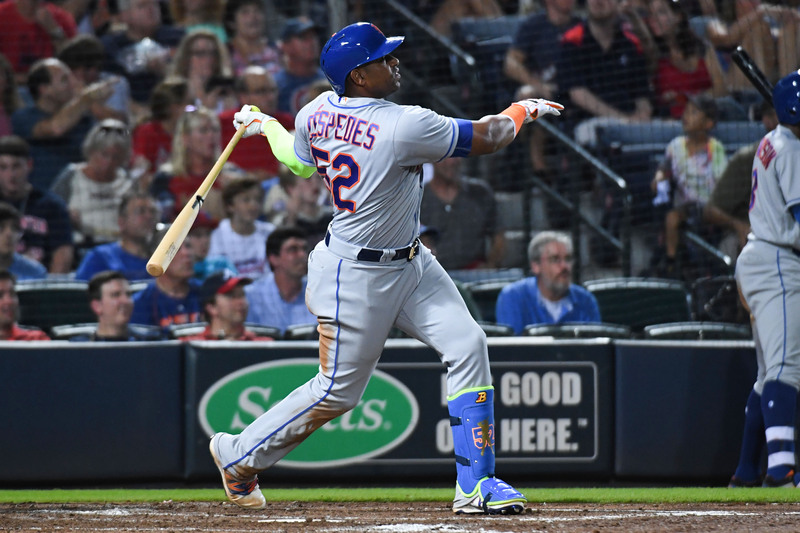 Jose Reyes and Cabrera loaded the bases with singles, and Cespedes demolished the 1-0 pitch for a grand slam, and his 30th home run of the season. Perez would not make it out of the inning, as he was pulled with a triceps injury. In total, Perez allowed five runs, four hits, a walk and a home run during his 2.2 innings. Reliever Joel De La Cruz fared not much better in his 1.1 innings. He allowed a solo home run to James Loney on a hanging changeup in the fourth and failed to earn an out in the fifth. After allowing a single to Cabrera (his third hit of the day) and a walk to Cespedes, De La Cruz was replaced by former first round pick Jed Bradley. Bradley had early troubles with control, and his high 80s fastball was hit hard out of the gate. Kelly Johnson and Alejandro De Aza scored each of the two inherited runners and Loney hit a double to add an earned run to Bradley’s line. Lugo earned his first MLB RBI with a sacrifice fly, bringing the Mets’ total to 10 runs. Mets bats were largely quiet for the rest of the game, as Bradley settled down in the sixth and seven innings and retired all six of the batters he faced. Brandon Cunniff shut down the Mets in the eighth and ninth innings, an outing most notable for the MLB debut of top Mets’ prospect Gavin Cecchini (he struck out swinging). Over his seven strong innings, Lugo displayed occasional problems with command, but worked through those issues to limit the Braves to two runs over seven innings. His fastball had life and regularly hit 95 mph (even hitting 96 mph as late as the sixth inning), but struggled with control of the pitch in the first and fourth innings. Some stellar defensive plays – including two well-fielded double plays involving Johnson at second base – helped Lugo out of jams. Lugo’s curveball was as stellar as ever, and in total he struck out five while only allowing one walk. The first of the two runs allowed came on a Freddie Freeman groundball single and the second on a pinch-hit home run by Brandon Snyder. Lugo’s fifth Major League start provided further evidence that he belongs in the Mets’ long-term rotation plans. Sean Gilmartin entered the game in the eighth and promptly gave up back-to-back ground ball singles to Jace Peterson and Ender Inciarte. However, a popup by Garcia and a double play induced by pinch-hitter Blake Lalli got him out of the inning unscathed. Logan Verrett entered to close out the ballgame in the ninth, but immediately gave up a double to Matt Kemp, who scored on a Markakis ground out. Problems persisted as former Met Anthony Recker walked on five pitches and Daniel Castro and Gordon Beckham each singled. Unable to command his fastball, Verrett was pulled with the bases loaded and one out. However, the Mets still had an insurmountable seven run lead, and Josh Edgin was able to generate the two outs necessary to end the game. On Monday, the Mets head to Washington to begin a three-game series with the Nationals. Embattled righty Rafael Montero remains in the rotation and makes the start for New York, while the Nationals have yet to announce who will pitch in place of the re-injured Stephen Strasburg. Potential replacements likely include hard throwing prospects Lucas Giolito and Reynaldo Lopez. The Mets are nine games behind the Nationals in the division, but now hold a half-game lead over St Louis for the second NL Wild Card spot.